When decorating for Halloween, pumpkins are your first port of call, and our pumpkin carving kit will help you create with ease. Black and orange are the order of the day when it comes to colours. Try hanging Halloween bunting with strategically placed spider web (complete with spider – fake of course!) over door frames and around stairs to give a fright. Set the mood with lots of lanterns, candles and tea lights dotted around to create an eerie atmosphere. We’ve got all you need to up the fright factor. Long dark nights are made for spooky gatherings and gothic feasts. 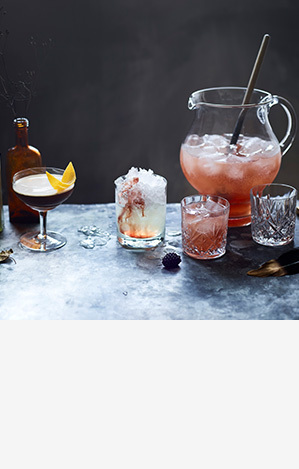 Bewitch your guests with these frighteningly good cocktails. Halloween night is a great adventure for children, from costumes and props to Halloween games and, of course, all the teatime treats! Mix and match homemade costumes with masks and accessories, go all out with cauldrons full of treats, and set the mood with Halloween decorations and spooky lighting. For fun games to keep them busy, try sending your little monsters on a treasure hunt to find spooky treats and surprises; let them take turns ‘wrapping the mummy’ with toilet roll; or have a creative pumpkin competition to see who can come up with the best design. Turn any dish into a frightful treat with some creativity and help from little hands. Find recipe ideas for Halloween themed bakes, sweet treats, pumpkin inspiration and something for the grown-ups: curious cocktails. Finish the look with some boo-tiful flowers from Waitrose Florist. Once the lights go out on Halloween, these 10 glowing Avalanche roses will emit an eerie glow to terrify your Halloween party. Stock up on party food for Halloween. We've got soft drinks and snacks, with great offers on sweets and chocolates too. Waitrose and John Lewis are working with The Royal Society for the Prevention of Accidents (RoSPA) to help people celebrate Halloween safely. Together we have come up with a few simple tips, so that we can all have fun by reducing the risk of accidental injury. Looking for tasty ideas for what to do with all those pumpkin carving leftovers? Or simply looking to gorge on some seasonal gourds? Whatever the reason, discover new and favourite ways to cook pumpkins and squash, from risottos and soups, through to cupcakes, pies and salads with our collection of pumpkin recipes.